Move to Detroit Quickly While There's Still Time! Nemos Makes the Top 10 Sports Bars in the U.S.
Karen Batchelor (right) with her sister Paula and her niece Madison, age 6, outside the house where Karen and Paula grew up in the Palmer Woods neighborhood of Detroit. The Other Detroit: The city’s grandest enclave clings to the dream. 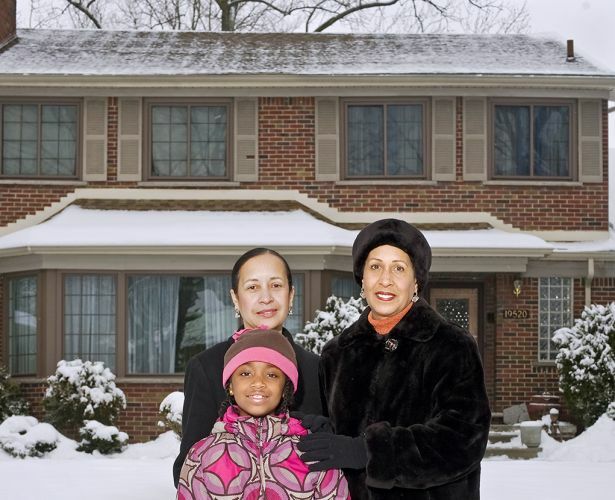 Karen Batchelor’s family moved into Palmer Woods in 1967, part of the first cadre of African Americans to integrate the affluent neighborhood on the outskirts of Detroit. They moved in December, after the long-simmering city had burst into racial violence that summer. Batchelor’s father, an internist, had witnessed Detroit’s previous race riots in 1943. Out on a date at Belle Isle—the flash point of the ’43 riots—he was injured in the melee. He had no interest in reliving the experience, so he and his wife decided to move their family out. Their 16-year-old daughter liked her old home, and was leery of being on the vanguard of integration. But her new house helped. “I remember seeing my bedroom, and it was pink, and it had a chandelier in it,” she told me. “We came from a very lovely home. But this one had seven bedrooms, five bathrooms, a swimming pool, a cabana, and three kitchens.” By her memory, the Batchelors were the ninth black family to move into Palmer Woods, a neighborhood of nearly 300 homes. The following year, several families from her old neighborhood followed—including Karen’s best friend—and the path was set. "I remember seeing my bedroom [for the first time], and it was pink, and it had a chandelier in it," Batchelor said. Batchelor’s parents eventually moved from Palmer Woods, but many of her friends and neighbors did not. Indeed, Palmer Woods now sits on a census block group that, according to the most-recent available data, is 81 percent black, and it is arguably the American black elite’s most majestic enclave. When I first visited, in the fall of 2009, I was awestruck. I had seen well-heeled black neighborhoods before—the prosperous suburbs ringing Atlanta and Washington, D.C., Chatham in Chicago, Baldwin Hills in L.A. But the gates of Palmer Woods are a wormhole out of the angry city and into an opulent idyll. Sleepy curvilinear streets with names like “Strathcona Drive” and “Argyle Crescent” snake through the 188-acre hamlet and its sprawling, irregular lots. Across Seven Mile Road sits the venerable, members-only Detroit Golf Club, which remained all-white until 1986. Even as Detroit groaned under the weight of crime, failing schools, and high taxes, Palmer Woods held steady. But the country’s financial straits, particularly the collapse of the real-estate bubble and the struggles of the Big Three automakers, were a direct assault on the region’s twin pillars: houses and cars. The neighborhood association considers approximately 15 out of its 292 homes to be in jeopardy. Problems that were once rare—crime, for instance—are cropping up, as Palmer Woods at last succumbs to the gravity of the city. As a result, those who were once excluded from the neighborhood’s vision of the American dream are now in the position of defending it. I took my first tour of Palmer Woods on a chilly fall evening with Barbara and Spencer Barefield and their Saint Bernard, Devo. Barbara is Jewish and a native New Yorker, edits the Palmer Woods Post, and helps organize neighborhood events—block picnics, classical concerts, and home tours. Spencer is African American, a jazz guitarist and composer; like Karen Batchelor, he moved to Palmer Woods as a teenager, in the wake of the riots. Spencer’s mother still lives around the corner in the home he grew up in. We walked outside, bundled in scarves and gloves, under a final blast of sunlight shooting across the cobalt sky. The streets were quiet, and I could have counted on one hand the cars that drove by. We passed a two-story house designed by Minoru Yamasaki, the architect who designed the World Trade Center. Then we stopped next door, in front of an earthy Arts and Crafts house, set at a right angle to the street, with the front entrance positioned deep into the lot. This was Clarence Darrow’s temporary home when he was summoned to the city in 1925 to defend Ossian Sweet, a black doctor who had taken up arms against white rioters who didn’t want him to move into their neighborhood. The owner was a regional bank that had foreclosed on the house after the elderly woman who lived there fell behind on her mortgage. We walked up the driveway past a parked car to the front door, where we stopped and admired the intricate tile work on the porch. The car, Spencer explained, had been placed there by a neighbor—a scarecrow against thieves, squatters, and scrappers. “They were pulling off copper gutters in broad daylight,” said Barbara. Established in 1915, Palmer Woods was envisioned as a primeval retreat from a teeming, industrial metropolis. The developer, Charles Burton, advertised it as “a safeguard from the encroachments of commercialism,” a paradise nestled in the city’s hinterlands. When restrictive covenants were ruled unconstitutional in 1948, black families began moving in, infusing the customs of black America’s ancien régime into the ethos of old Detroit money. They pledged their children to Jack and Jill of America, joined the neighborhood association, and held potlucks and barbecues to raise money for local charities and black artists. Many had or went on to illustrious careers: Lamont Dozier was part of the popular Motown songwriting team Holland-Dozier-Holland. Keith Ellison became the first Muslim congressman. I grew up in Plamer Woods and quite honestly, get a wonderful, warm feeling every time I drive through the 'old neighborhood'. In addition, there is a wonderful Frank Lloyd Wright house that has recently undergone a major renovation. This is just one more 'feather in the cap' of this stately, mature neighborhood.